Dear friends! You are welcome to enjoy the atmosphere of childhood! when you felt your happiness filled you from head to foot! The BUDI BASA Company has acted a partner in the Spring Ball, organized on the occasion of the 10th anniversary of the Diamond Kids Academy at Metropol Moscow Hotel. Our toys were a beautiful complement to the gala evening as well as a great gift for participants and star guests! 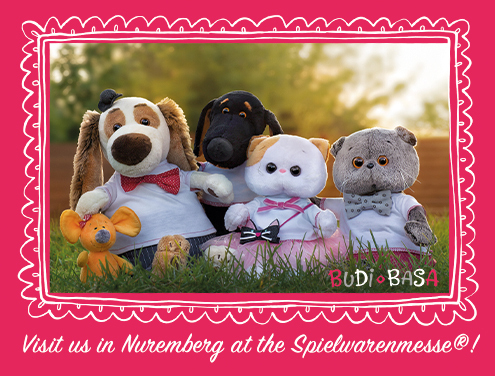 Visit us in Nuremberg at the Spielwarenmesse®! Items in TrendGallary, Hall 3А: Basik and Company. Welcome to the world of BUDI BASA company, the world of Russian manufacturer of the unique toys and gifts! We truly believe that you appreciate our heroes: Zaika Mi, Basik&Co, BernArt. See you soon in Nuremberg? We are looking forward to meeting you there!